Over the course of their work accumulating valuable data about the Earth for scientific use, satellites also give us some pretty spectacular imagery of our planet from afar. Earth-observing satellites show us what global cloud cover looks like, help us discover unknown ancient waterways, and let us look at storm systems from above. Since the 1970s, the U.S. Geological Survey has been gathering satellite imagery of Earth using the Landsat program. Since 2012, the USGS, along with NASA, has curated multiple collections of amazing Landsat images chosen purely for their value as fine art. Some of the images are altered to highlight certain data points or increase their color contrast, but other than that, they’re entirely works of nature. A map of crops growing around the Tietê River in Ibitinga, Brazil. Lavender, purple, and blue mark active crop growth, yellow indicates urban areas, and light yellow and white indicate places with little vegetation growth. 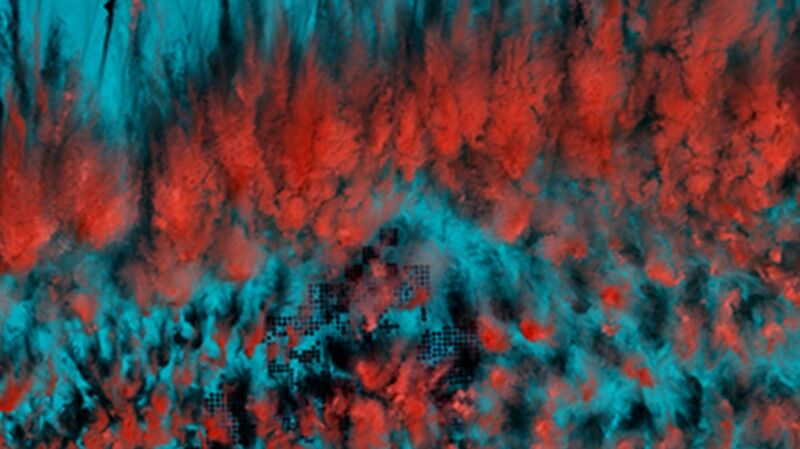 You can see the rest of the latest Landsat images and past collections from Earth as Art from the USGS.